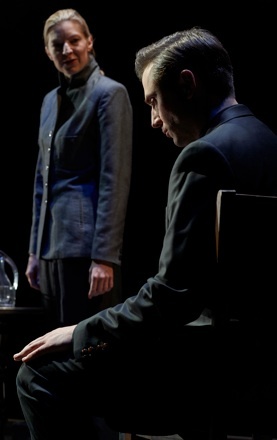 Adam Seybold’s The De Chardin Project won the 2013 Dora award for Outstanding New Play in the Independent Theatre category. An uncommonly intellectual play, it takes a look at the confluence of science and religion in the life of the great French thinker Pierre Teilhard de Chardin (1881-1955), who was not only a Jesuit priest but also a paleontologist and geologist. Director Alan Dilworth gives the play a highly imaginative staging, but his theatrical invention cannot disguise the fact that Seybold’s play is essentially undramatic. Seybold begins the play just after Teilhard (Cyrus Lane) has suffered the heart attack that would claim his life. An enigmatic spirit Guide (Maev Beaty) appears to him to lead him to the next plane of existence. This journey seems to involve revisiting past significant events in Teilhard’s life from childhood to old age with the Guide taking on the guise of all the people with whom Teilhard interacts. What Seybold gives is basically the old notion of a dying person’s life passing before his eyes. We see how he learns the concept of infinity from his mother along with the idea that death is just a passage from one state of existence to another. From a discussion with a British boy in Egypt, we see how Teilhard views the cross as a symbol of the intersection of our daily lives moving ahead horizontally, en avant, with a vertical pull to evolve to a higher state of being, en haut. When we see him teaching we learn that he regards Genesis not as a factual statement of history, as some fundamentalist Christians still do, but as a metaphor for spiritual evolution. Since St. Augustine, the Catholic Church had had the notion of the Fall of Man as a felix culpa, as in the Paschal Vigil Mass, “Exsultet O felix culpa quae talem et tantum meruit habere redemptorem ("O happy fault that earned for us so great, so glorious a Redeemer"). Teilhard, however, in viewing the Fall as necessary to Man’s development cannot see it as a fault. For this unorthodox view Teilhard is punished by the Church. He is no longer allowed to teach and none of his theological or philosophical writings, including his most important work The Phenomenon of Man (written 1938-40), may be published. Given the choice whether to leave the Jesuit order or to live in “exile” in China where he was conducting paleontological excavations, he chose the latter. One result of his work in China is that he became one of the discoverers of Peking Man, the missing link, he thought, between prehistoric and modern man. We find out most directly the gist of Teilhard’s thought when he explains it to his secretary Lucile Swan . Teilhard does not believe that science and religion are incompatible. In fact, he believes that they are inextricably intertwined in that the purpose of creation is evolution. In The Phenomenon of Man Teilhard lists five stages of this evolution. Geogenesis is the formation of the earth. Biogenesis is the evolution of life from matter. Anthropogenesis is the evolution of man on earth. Noogenesis is the emergence of the self-reflective mind in man. Seybold omits the fifth stage which is “Christogenesis”, or the merging of the human with the divine. Instead Seybold stops with noogenesis and concludes the play with the Guide giving Teilhard a vision of the discovery of cave paintings that could serve as proof of Teilhard’s concept of noogenesis. the vows of poverty and chastity that he took on becoming a priest. Yet, Teilhard, born to a wealthy family, did not become a priest until age 30 and Seybold tells us nothing about how that important decision came about. As is often the case in plays about famous thinkers, Seybold’s series of snapshots about the man gives us an idea of the varied circumstances he encountered but we emerge with no clear picture of what Teilhard was like as a person, why he thought as he did or whether his thinking about evolution itself evolved over time. This means that the role of Teilhard is not very interesting. For the vast majority of the play Cyrus Lane plays Teilhard as the same unchangingly stolid character, superficially friendly but primarily inward-looking. While he plays the young Teilhard as a boy, he does nothing to age Teilhard as the action progresses, even saying that he is an old man at the end with the same vigour of voice and limb he had used earlier. The role of the Guide, in contrast, provides a showcase for the actor. Maev Beaty successfully adopts American, British and Canadian accents while playing both men and women of different ages and backgrounds. Her portrait of Teilhard’s mother is clearly distinct from her impression of a curious British boy in Egypt, a sacred American soldier in World War I, an aged Jesuit Superior General or the American woman who becomes his secretary and falls in love with him. Beaty’s performance is outstanding, but the dazzling variety she displays only shows Teilhard as opaque and monochrome. The physical production of the play is inventive. The Theatre Passe Muraille Mainspace has been reconfigured so that the stage, rather like a rectangular boxing ring, stands elevated and separate from the audience surrounding it on three sides. Director Alan Dilworth and designer Lorenzo Savoini seem to have taken a page out of the style of the British company Complicité in a show like Light (2000), where the seemingly bare stage is revealed as a treasure chest of props. Through trap doors in the set, the Guide produces chairs, tables, water jugs, teapots, indeed whatever props are needed in any given scene. This combined with Savoini’s squares of light and Thomas Ryder Payne’s sometimes starling soundscape are what lend the show its magic. Quite contrary to Seybold’s intention, what attracts us most to the play is everything that does not have to do with its central character who remains nearly as unknown by the end of the show as he was at the beginning. Rarely does Seybold ever allow Teilhard to express his thoughts in the ecstatic manner that shines through in his writings and has won his thinking a large following around the world. The illuminating joy of transcendence, the sense of his speaking to us as from soul to soul, is something that the structure of Seybold’s play singularly fails to capture. Photo: (from top) Maev Beaty and Cyrus Lane; Maev Beaty and Cyrus Lane. ©2014 Michel Cooper.